Queen Isabella of Castile, Empress Maria Theresa of Austria, and Queen Victoria of England were respected and admired rulers whose legacies continue to be felt today. Their daughters—Catherine of Aragon, Queen of England; Queen Marie Antoinette of France; and Vicky, the Empress Frederick of Germany—are equally legendary for the tragedies that befell them, their roles in history surpassed by their triumphant mothers. Because of his doomed marriage to Queen Catherine, Henry VIII broke away from the Roman Catholic Church, triggering the English Reformation. To many, responsibility for the French Revolution and the Reign of Terror fell squarely upon Marie Antoinette. And Empress Frederick proved insufficient in getting Germany to rise to political maturity: under her son's reign, the country plunged into the beginnings of world war. 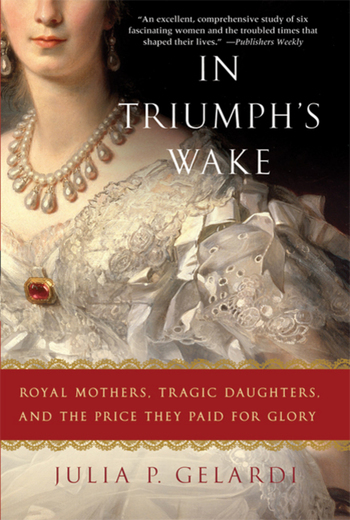 In Triumph's Wake is the first book to bring together the poignant stories of these mothers and daughters in a single narrative. Julia Gelardi is the author of Born to Rule and From Splendor to Revolution. Educated in the United States and Canada, she is an independent historian and author, currently living in Minnesota with her husband and two daughters.